Deep, rich, pungent. Fresh cantaloupe, tangerine zest, caramelly chocolate, sandalwood, magnolia-like flowers in aroma and cup. Roundly and sweetly brisk in structure; satiny in mouthfeel. Fruit, floral and sandalwood carry into a crisply drying though sweet-toned finish. 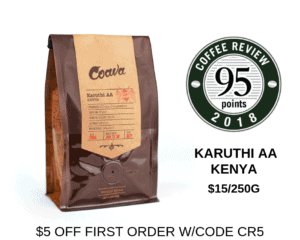 This coffee tied for the third-highest rating in a cupping of coffees from Sumatra for Coffee Review’s April 2019 tasting report. Processed by the atypical (for Sumatra) honey method, in which the skin is removed from the coffee fruit immediately after picking, but the seeds or beans are dried with all or part of the sweet pulp, or fruit flesh, still adhering to them. Small Eyes Café is a small, family-owned coffee shop in Yilan, Taiwan, specializing in artisanally roasted specialty coffee and homemade desserts. Visit https://www.facebook.com/Smalleyescafe for more information. The Bottom Line: An unusual honey-processed coffee from Sumatra: graceful, balanced, quietly original.